Until recently, I can't remember the last time I didn't have to touch up my makeup throughout the day and going out without a face powder in my handbag was practically unheard of. 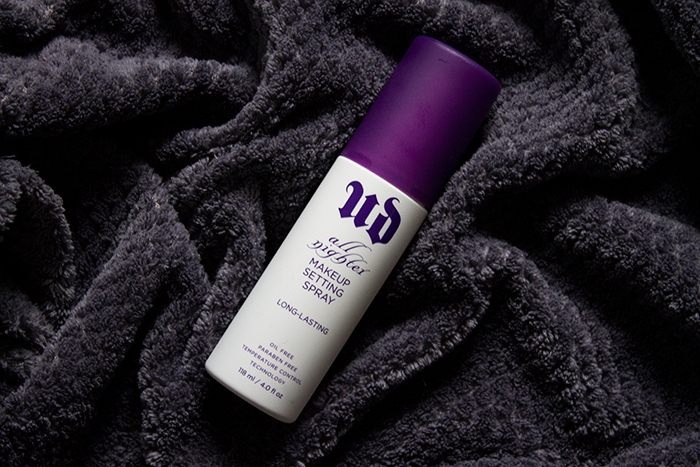 Fast forward to this past month or so when I picked up the Urban Decay All Nighter Makeup Setting Spray and put it to the test on my oily skin. Here's how I got on. If you weren't aware, the Urban Decay setting sprays are made by a brand called Skindinavia who specialise in setting sprays. I loved the Skindinavia sprays years ago but they were only available in America and I wasn't a big fan of the hefty customs charge to have it delivered here. Thankfully they've now teamed up and it's far more accessible to us in the UK. The All Nighter setting spray boasts about a 16 hour makeup staying power just by using this spray, a pretty bold statement in my opinion. You simply spray it over your freshly applied makeup in a T and X motion and your makeup will stay put. No melting away or a need for powder touch ups. As I'd tried the Skindinavia sprays before I had high hopes for this version and I'm glad to report it's just as good as the originals. While I can't say I had a full 16 hour wear (who wears makeup for that long anyway?) my makeup lasted throughout my 8 hour work shift and still looked as fresh as when I applied it this morning. I still had a tiny bit of oilyness once my work shift was over but it was nowhere near what it would be like if I hadn't used the spray. Oily skinned girls, you need this!